I am trying out my new Mount Vision soft pastels. 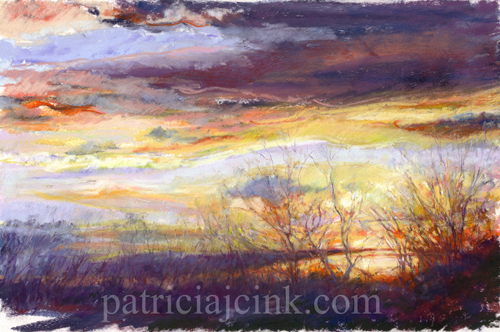 This is the first pastel done with my new Mount Vision Pastels. The quality and color range of the pigments, especially the darker pastels, is a delight. The scene is of a winter sunset in which the clouds created a lake behind the trees, allowing the sun to glow as if off a calm lake.